(AP) - Nobel Peace Prize laureate Desmond Tutu won't be speaking at the University of St. Thomas in April because school officials are worried his views on the Israeli-Palestinian conflict would offend the Jewish community, a school official said. And an associate professor who pushed for Tutu's visit has been removed as director the university's justice and peace studies program. The Rev. Dennis Dease, St. Thomas' president, decided not to invite Tutu after talking with his staff, said Doug Hennes, vice president for university and government relations. "He (Tutu) has been critical of Israel and Israeli policy regarding the Palestinians, so we talked with people in the Jewish community and they said they believed it would be hurtful to the Jewish community, because of things he's said," Hennes said. Hennes said the university does not believe Tutu is anti-Semitic. But Hennes cited a 2002 speech in which he said Tutu criticized "the Jewish lobby." Hennes also said Jewish groups feel Tutu has compared the Israeli policy toward Palestinians to how Adolf Hitler treated Jews. Julie Swiler, public affairs director for the Jewish Community Relations Council of Minnesota and the Dakotas, said she told St. Thomas officials that Tutu's remarks were hurtful to Jews. In addition to comparing Jews to Hitler, the speech "questions Jewish faithfulness to God," she said. In his speech, Tutu said he supported the existence of the state of Israel, but compared the treatment of Palestinians to that of blacks under South African apartheid. He also criticized demolition of Palestinian homes if Israeli authorities suspected a family member was a terrorist. Tutu said he wasn't criticizing Jewish people, but the Israeli government. "The apartheid government was very powerful, but we said to them, 'Watch it,'" he said in the speech in Boston. "If you flout laws of this universe, you're going to bite the dust. Hitler was powerful. (Josef) Stalin was powerful. Idi Amin was powerful. "A lie, injustice, oppression, those will never prevail in this world of God," he said. Marv Davidov, a peace activist and teacher at St. Thomas, was dismayed with the university's decision. "I am Jewish, and stifling debate and dissent (and) criticism of Israel is a disservice to all Jews, the state of Israel and the American people," he said. A leader of the international group that was to sponsor the visit also disagreed with the decision. "This is a tragedy for the entire community of Minneapolis-St. Paul and indeed for the entire state of Minnesota," said Ivan Suvanjieff, president and co-founder of Colorado-based PeaceJam. 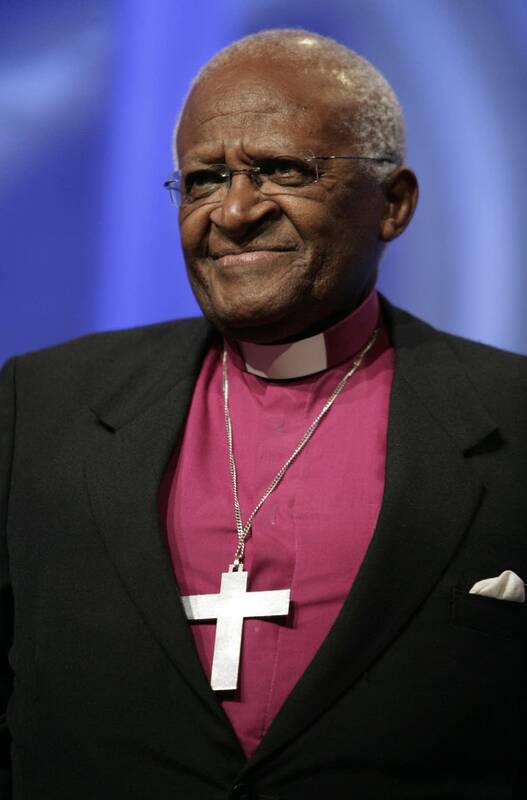 "Archbishop Desmond Tutu is a towering moral arbiter of our day. He has worked tirelessly on a global basis in the name of human rights and all that is decent." Mike Klein, who taught at St. Thomas and is a board member of Youththrive, PeaceJam's Upper Midwest affiliate, said the group learned the 75-year-old Tutu was available in April. "I was quite excited about it, and passed on that news, expecting the same excitement back from the administration," Klein said. "Instead, the response I got was, 'We will have to pass.'" Meanwhile, Cris Toffolo, an associate professor and former director of the university's justice and peace studies program, wrote two memos urging university officials to reconsider their position. She said asked whether the university reached its conclusions based on a Web site that she said misquoted Tutu as linking Israel to Hitler. Toffolo said she received a letter in August removing her as director of the peace studies program for two reasons: She had kept pressing to invite Tutu, and she should not have sent Tutu a letter using her director's title to tell him what happened. Hennes confirmed Toffolo had been relieved of the position, but could not disclose the reasons. He said she is still a tenured faculty member. Tutu will instead visit Metropolitan State University in St. Paul from April 11-13. He'll meet with 300 young people who have been working on projects to "change the world," said Donna Gillen, executive director of Youththrive in Minnesota.